It's a Wednesday afternoon at St. Helens High School and the aroma of freshly cooked tortillas, carnitas and lengua wafts through the air. In a classroom in the back of Building B, teachers and other school staff hungrily chomp down on Mexican street-style tacos, sip hibiscus tea, munch fresh churros and casually chat during lunch hour. The classroom is lively, decorated with multicolored paper streamers hanging from food serving stations as Mexican music plays in the background. 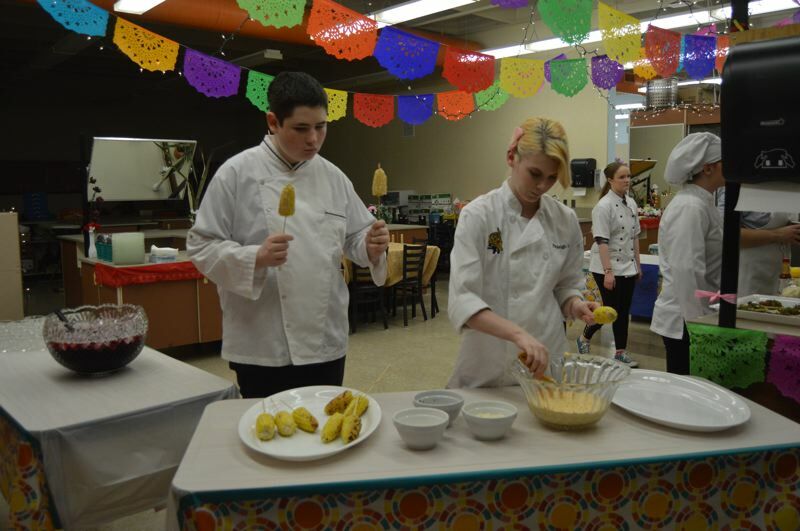 Students dressed in white chef coats give friendly smiles as they serve grilled corn covered in cojita cheese and sprinkled with spices and cilantro, or dish fruit salad and help guests drizzle chocolate sauce over freshly fried churros. The group of high schoolers is in the top level of culinary classes offered at St. Helens High, a program called chef school. Almost monthly, the students serve a menu to staff during teacher cafes, events where school staff can pay $10 for a fresh cooked meal prepared by the students. Each cafe has a different theme, and so far this year the student cafes have centered around Thai food, a Mexican street fair and even Harry Potter, the latter wildly popular with staff. Teachers Alex Reed, Lisa Buchco and Naomi Reed comment on how delicious the food is and how they enjoy the dish varieties. Others, like Neha Hertzog, the school's social worker, savor the novelty. "Every time I've gotten to try something I haven't tried before, Hertzog said, "and it's always delicious." 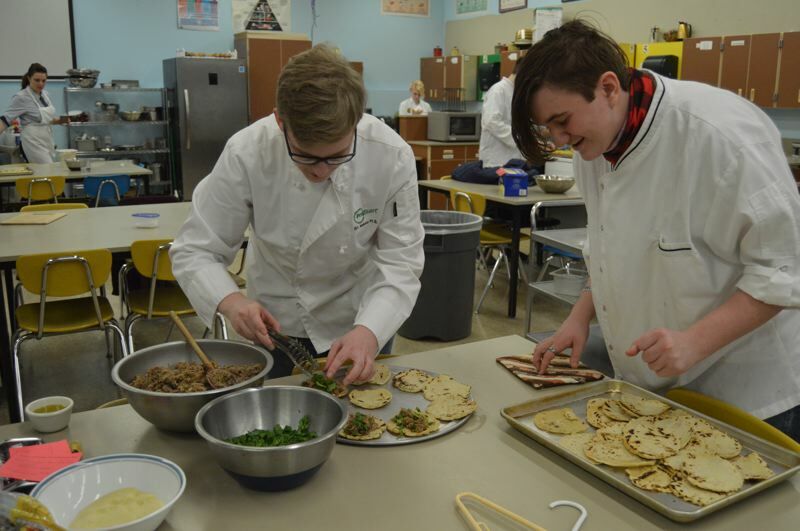 While the teacher cafe program is not entirely new at the school, it has taken on a creative new twist this year under the direction of the school's newest culinary arts teacher, Amelie Rousseau. Rousseau said the menu selection is often a collaboration between her and the students. She often picks the theme and chooses main dishes, but when students are passionate about a dish that pertains to the theme, they'll often work it in. "I love having ideas from them," Rousseau said. "Sometimes I choose stuff, but if they've seen something they like and bring in the recipes, we'll try it." Some of the students in her class have taken the chef school elective before, but said they are enjoying new challenges the class offers this year and have been pleased with the way staff are responding to the program. "It feels great because the teachers seem to like the food and it makes me happy. There are a lot more happy faces and people showing up than last year," said junior Finleigh Sweet. Before students can take the top level chef school class, they go through a course called teen cuisine where they learn kitchen safety, knife skills and other basics. After that, students can take the international cuisine class, where they prepare dishes from different cultures and get to test out more exotic ingredients. Then, if they wish, students can take chef school, which focuses more on catering. Some students have taken the class and discovered a passion for culinary arts and hope to pursue it professionally, while others like learning cooking skills they can use at home. Kaitlyn Sittel, a junior, said she grew up watching the TV show "Master Chef" and always aspired to be like celebrity chef Gordon Ramsey. Taking the culinary classes has taught her more hands-on skills to achieve that goal. "I love being able to make foods from different cultures. You get to eat different meats and different cheese and different spices you've never heard of," Sittel said. Makayla Musaraca, a transition student at the high school, said she initially thought about pursuing nursing, but discovered her passion for being in the kitchen by taking the culinary classes. "I want to be a chef and work in the kitchen," Musaraca said. "I think chef school is more me." Rousseau, in her first year teaching at the high school level, she said enjoys the students' curiosity. "They're willing to try new things and learn from their mistakes too, because that's the thing with cooking — you learn from the mistakes and from what you mess up sometimes," Rousseau said. Conner Kelley, a junior, said that while he doesn't enjoy serving dishes much at the teacher cafes, he enjoys seeing the end result — clean plates. "I think it's satisfactory enough to see an empty plate come back, because they've eaten it all," Kelley said.